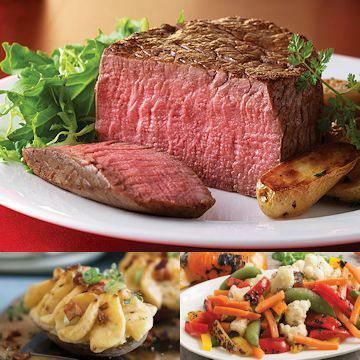 Fork tender and delicious, Filet Mignons are accompanied by our All Natural Seasoning to perfectly complement your steak. Completing your meal are Stuffed Baked Potatoes with a blending of whipped potatoes, sour cream, cheddar cheese and bacon and Roasted Vegetable Medley in a delicately seasoned butter sauce. Meal serves 4.